For the average Canadian teacher, the war in Afghanistan seems remote. It is a news story we can turn oﬀ and ignore. And we can argue about Canadian participation in this mission with impunity because it has little impact on our daily lives. But for teachers working at schools in and around Canadian military bases, the war is a reality that cannot be ignored, and its impact on their lives and those of their families and students is incalculable. 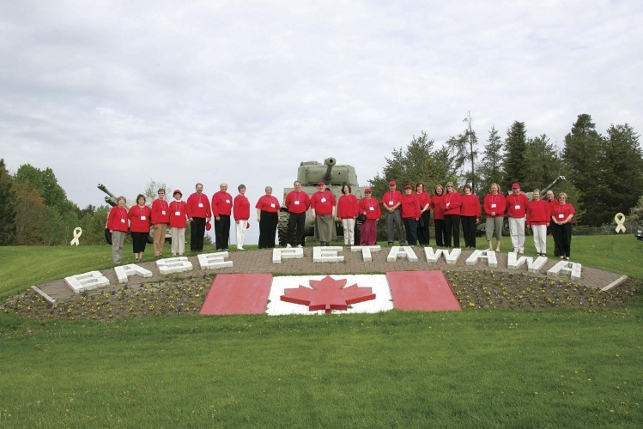 CFB Petawawa, located in the heart of Renfrew County, is a case in point. It is home to 5,400 military personnel, 45 of them spouses of the 440 teachers and occasional teachers employed by the Renfrew County District School Board. Since the deployment to Afghanistan began in 2005, 20 Petawawa soldiers have been killed and another 80 injured. In a small town of 15,000, such statistics are truly staggering and have far-reaching consequences for the entire community. To gain more insight and to provide support for teachers and students in Renfrew, ETFO President Emily Noble and other members of the provincial executive, local leaders and provincial staff, representatives from OSSTF and OECTA, and senior Renfrew County District School Board staff attended brieﬁngs at CFB Petawawa in May. Project Petawawa began with a tour of the military base. Commanding Ofﬁcer Lt. Col. Dave Rundle provided the group with an overview of the base. He described the mission in Afghanistan and the military support programs that assist soldiers and their families during the deployment and reintegration process. He acknowledged that since November 2005, when the active phase of military engagement began, the number of military families seeking psychological services has jumped more than eight-fold. A key component of support for military families is provided by the Petawawa Military Family Resource Centre (PMFRC) situated on the base. It offers a wide range of services for children, youth, and adults, including crisis intervention, childcare, parenting skills instruction, and help with issues related to deployment. Families of members of special task force units may suffer additional trauma, because these soldiers are not allowed to share even the most basic information about their tour of duty. And there is the “What if?” factor. According to Michelle Belec, coordinator of the PMFRC’s school-based deployment pilot project, many families experience a heightened state of anxiety because they fear that their loved ones are not going to come back or may return with serious injuries. During the town hall meeting organized by the Renfrew locals for ETFO members, the delegation heard ﬁrsthand accounts of the stress that teachers working in schools on or near the base experience. The personal and professional challenges they face are daunting. Colleen Finn, a school support counsellor in the Petawawa family of schools, focuses on deployment issues and has ﬁrsthand experience with these home-front casualties. She described working with children who refuse to participate in the Red Friday Campaign because for them it evokes images of blood and death.1 Others become terribly upset on special occasions like birthdays and Christmas if a parent is not there to join in the celebrations. Low EQAO scores in schools on and around the base are an additional source of concern. Several teachers described the frustration of struggling to raise literacy and math levels in an environment where students and staff are subject to daily anxieties related to the war. As one teacher pointed out, educational researchers do not know how stress affects students’ short-term memory and executive function but it seems logical to assume that emotional turmoil might contribute to poor academic performance. Many of these teachers are actively engaged in making a difference. Remember those kids whose parents are overseas for such signiﬁcant events as birthdays and important holidays? Colleen Finn helps to make these occasions meaningful in other ways. “We try to focus on the positive things, even though they may not feel that positive,” she says. Currently, she is working with Care Canada to get local kids involved in a variety of humanitarian projects. Megan Egerton has developed a series of curriculum resources on deployment issues. Both practical and imaginative, they cover a wide range of topics and suggested activities. A couple of examples: a schoolwide project enables students to “Walk to Afghanistan” as part of their physical education ﬁtness program; maintaining a “Feelings” graph allows kids to monitor their emotions at school in a supportive atmosphere. Many teachers say they have been disappointed by the lack of compassion displayed by the Renfrew County District School Board. They spoke of being denied leave to spend time with spouses returning from Afghanistan and of being refused permission to attend memorial services for slain mili- tary personnel. Recently, the RCDSB has begun to recognize that teaching staff affected by military deployment require special consideration when it comes to leave. According to Renfrew local president Alice Paige, teachers can now successfully apply for this leave. At the provincial level, ETFO executive members have developed a series of recommendations, several of which deal with collective agreement language that would provide members who have immediate family in active military service access to paid leave. In addition, ETFO plans to organize a regional conference in co- operation with military personnel and the PMFC during the 2007/2008 school year with a focus on classroom strategies and stress management techniques designed to support members and their students. ETFO also intends to lobby the provincial government to make sure there is adequate funding for services. For several years now, in and around Canada’s military bases, teachers, their families, and students have been operating in an emotional war zone that is poorly understood and under-appreciated by those of us not directly involved. Increasing our understanding is one way we can all show our support. 1 The Red Friday Campaign, was initiated on military bases in the U.S. in 2005 as a way to support the troops. Military wives on Canadian bases picked up on the idea and have promoted it across our country; everyone is asked to wear something red each Friday.